There is this concept called “technical debt” in software development. It refers to the idea that code written quickly or without proper documentation creates a sort of debt with interest. This is because the code becomes more and more difficult to clean up and properly document the longer you wait. Proper documentation of your audio, video, lighting and networking equipment is exactly the same. Right now you’re thinking “it’s just a new switch. I’ll throw it in and let everyone know later…” but four months from now when the pastor’s iPad remote isn’t working nobody has a clue it’s because the cleaning person unplugged that switch to vacuum and forgot to plug it back in. Not that it’s ever happened to me… but, you get the idea. Every piece of equipment, cable or software should be installed with some level of documentation. Don’t pretend you’re going to take the time later. If you do remember, it’ll take longer and you may even forget the key reason you installed it in the first place. Key #1: Document changes as you make them! NASA has step-by-step instructions for every conceivable problem. Most of these instructions exist because a bunch of really smart people had to figure out–on the fly–how to solve some sort of failure and probably save some poor astronaut’s life. Instead of just assuming everyone would remember for next time, they document each step so they have a reference if it ever happens again. Now, our stakes aren’t quite as high in terra-based tech, but next time you can’t get audio from that wireless handheld or that bank of lights doesn’t turn on when you call up the cue: write down how you fixed it. Not only will it save you time when it happens next, but it could save a service if it happens when you’re not there. One good way of doing this, is to create a Google Drive or Dropbox folder the team has access to. Create folders for various pieces of equipment and documents that outline the basic troubleshooting steps. When you force yourself to put what you expect of your team into words it forces you to think about why you expect certain things. 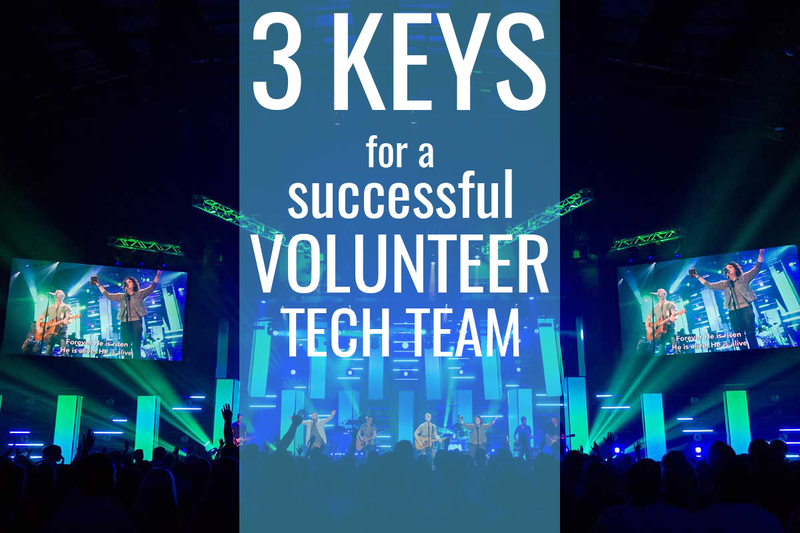 For example, we ask our projection team to show up at 7:30 Sunday mornings so they can be around while the band runs through the set. Now, it’s pretty easy for somebody to say “why on earth do I have to be there at 7:30 to turn on a computer and some projectors”? However, if you force yourself to write out your expectations you’ll start to think through the why. For us, the “why” of a 7:30 start is that projection is absolutely critical to a newcomer’s engagement in worship. If the projectionist didn’t have a solid handle on the band’s set they were often changing slides late or missing sections of a song completely. When we communicate that the job is important, and that being there at 7:30 helps you do a good job, then it becomes a fair expectation. The “why” is important! Even though it may seem like you’re asking a lot, your team will appreciate knowing what you expect. It informs them that you are serious about this and that you’re interested in helping them do their best. Vagueness is a way of unintentionally communicating that you don’t really care, which leads to a team of people who don’t really care. Make it easy on them, tell them what you expect. Maybe the better way to say this is “It helps you help your team improve”. Clear expectations gives your team something to meet, and something for you to discuss if they don’t. No expectations, no goals, no improvement.